How Far is Girija's Marvel? Girija's Marvel a Residential project is developed by Girija Builders in Chandanagar, Hyderabad, the latest project in Chanda Nagar, which is one of the fast-moving area, a Convenient for all the major locations. Elegantly crafted interiors and exteriors to meet the needs of modern lifestyle. This Project Offers 2BHK and 3BHK flats for sale in Chanda Nagar, Hyderabad with best amenities at an affordable price. 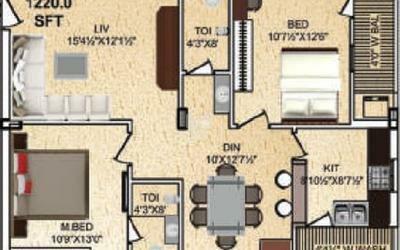 2BHK flats vary from 1175 Sq ft to 1285 Sq ft and spaciously designed 3BHK flats varies from 1425 Sq ft to 1650 Sq ft, spread across 5 acres which contain 400 units with 80% open space, where importance is given to ventilation and natural light. Girija's Marvel is located at Chandanagar Hyderabad which has great connectivity with locations like Serilingampally hi-tech-city, Madhapur, Gachibowli, Miyapur and to Kukatpally. Renowned Educational Institutions, Hospitals and Premium shopping malls like Manjeera mall, Sujana forum mall are near to this project. You can reach other parts of the city through a public and private mode of transportations. This Project provides amenities like Landscaped Garden, Intercom, ATM, Multi-purpose Hall, Wi-Fi, Clubhouse, Swimming Pool and more to make residents life joyful. At Girija's Marvel, the residents can feel their life happy with the Environment. MAIN DOOR : Polished teak wood with moulded panel vennered dooe with standard lock and SS hardware fittings. WINDOWS : UPVC Frames with plain glass and additional mosquito screen. 9" External wall and 4.5" Internal wall with quality CLC Bricks/ RED Bricks in cement Mortar. ALL ROOMS : 2'*2' virtified tiles of standard make. INTERNAL : Smooth plastered surface treated with lappam/putty and painted with emulsion. EXTERNAL : Sand finished plaster with whether proof paint of approved make. Kitchen: Glazed ceramic tile dado upto 2"height above kitchen platform. Toilet: 1st Class designer wall tile dado upto 7"height of quality make. Glazed ceramic tile dado upto 3"height. Washbasin of standard. EWC with push valve type of flushing of standard make. Provision for Geyser & Exhaust fan. All CP fittings of standard make. 3 Phase power supply for each individual flat. PVC piping of Sudhakar or equivalent makes. Concealed copper wiring of standard make. AC Points for all Bedrooms. Power points for cooking range, chimney, Microwave, Refrigerator, Mixer, Grinder in Kitchen and Geyser point in Toilets, Modular switches of standard make. Lift of Standard make as per design/Approval. Generator power for lifts, borewells, commonarea lighting and 1KVA capacity for each flat. 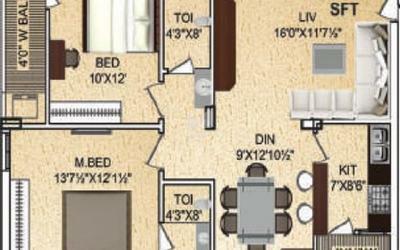 3BHK - 2 Parkings, 2BHK - 1 Parking. Girija Builders is a real estate industry leader that has built a strong reputation of excellence through its quality residential, commercial and gated community developments. The company’s expanding portfolio consists of 25 projects mostly focusing in and around Hyderabad, under various stages of planning and construction. The company has a notable and consistent track record of growth, customer satisfaction, and innovation.